The team at EyeSpy intrinsically understand how hard it is to find the perfect hire for your team. Over nearly a decade of working with them, I've come to appreciate how they work to understand the profiles of their clients' companies, leadership teams, and cultures. Working closely individual hiring managers, they adapt and fine tune their candidate short lists to hone in on those with the right fit. Additionally, their extensive knowledge of the industry, market, and network of relationships makes their already nuanced skills even more effective at helping you build out your teams. 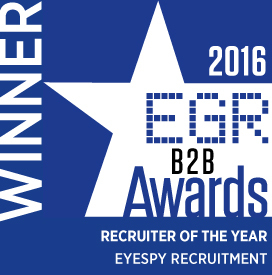 EyeSpy recruitment is one of the best agency in the recruitment business for gaming. They are always in your corner, making sure you remain informed every step of the way while providing the necessary feedback. They have an eye for talent and I wouldn't hesitate a moment for them to both get people for my team or send the right opportunities my way. I got hooked up on Emma’s contagious enthusiasm from the very first call we had. She’s been an absolute star, providing guidance, encouragement and support throughout lengthy process. On scale 1-10, I would rate the ‘service’ a 15. This is because Emma puts her heart and soul into it, which makes the service much more than ‘a service’. I wish to express my sincere gratitude to Emma and EyeSpy for reaching out, going extra 10miles and making it happen. THANK YOU! I wanted to reach out and share with you how much I have enjoyed working with EyeSpy. Your company is much more than just providing recruitment services. For me it meant getting competent career advice and finding the right opportunity. This is my second time working with EyeSpy and I can say that your service has absolutely exceeded my expectations. Building a meaningful relationship with your candidates is amongst your top priorities, which totally resonates with my understanding of providing a quality service. That is why I would definitely recommend EyeSpy to anyone that is looking to successfully progress in their career. Just a note to reflect on recent engagements – as per all previous engagements over the years, and back to my time in William Hill, I continue to marvel at the high ‘hit ratio’ you provide in selecting the ‘right’ candidates for our opportunities. Whereas with most agencies the proposed short list requires significant ‘weeding’ (and our time), with EyeSpy’s we are always straight in to the hard yards of selection between very close matches. It is clear to me you go the ‘extra mile’ in testing candidate suitability – competencies, but also (crucially) cultural fit, and this is hugely appreciated in helping us move quickly / build the right teams for us – as we continue to grow I look forward to increasing our levels of engagement – thank you! EyeSpy were a joy to work with from start to finish. Unlike some recruiters, they put me first, were realistic about what’s possible, and were particularly quick in providing feedback and next steps. What’s more, the team went above and beyond the call of duty to help me relocate and settle in a new location post-placing me in the role. They genuinely care about their candidates, not just their commission. I’ve worked with Jo at EyeSpy for 18 months now and Jo has been my primary head-hunter, always finding exceptional talent, working round the clock and always available. She supported us as we undertook a major recruitment drive for a new office in London with some very tight deadlines, Jo was pivotal in supporting me getting the right talent on time whilst being a pleasure to deal with on a day to day basis.